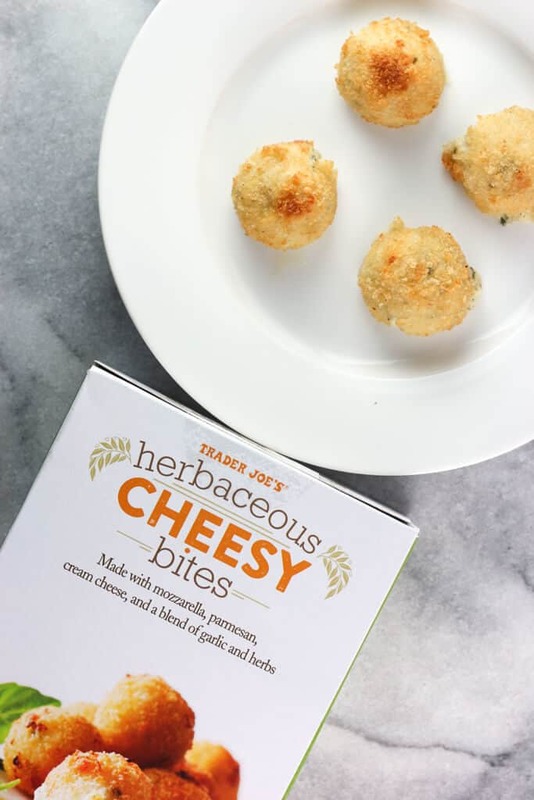 Well, cheese is always a hit in my household for appetizers. It doesn’t matter if it is melted or sliced or part of charcuterie board. In fact, my husband and I had these one night for dinner (and a series of other appetizers that I’ll get to in the coming weeks). What you think of these might vary. Why? Because mine did not (for the most part) keep their cute round shape). Of the 12 bites, only about half stayed in their round shape. A lot of mine looked like they were a smidge flat. Kinda like a flat tire. The rest became oval orbs on my baking sheet. They were tasty orbs. In fact, one thing omitted from the directions is to enjoy these warmed, but not hot. Two minutes might not be quite enough to cool these down enough. As much as the imagery on the packaging might have you believe that these are some kind of grown up mozzarella stick, they really aren’t. First off, this is a cream cheese based item. So if you are trying to eat this too warm, it’s just not going to keep its shape, much like the now discontinued chicken parmesan lollipops. Yup, while mozzarella sticks are best served right out of the fryer, these will be much better if you let the now softened cheesy cream cheese mixture come back to something just warmer that room temperature you will be rewarded with melty cheesy, slightly garlic-y bites. 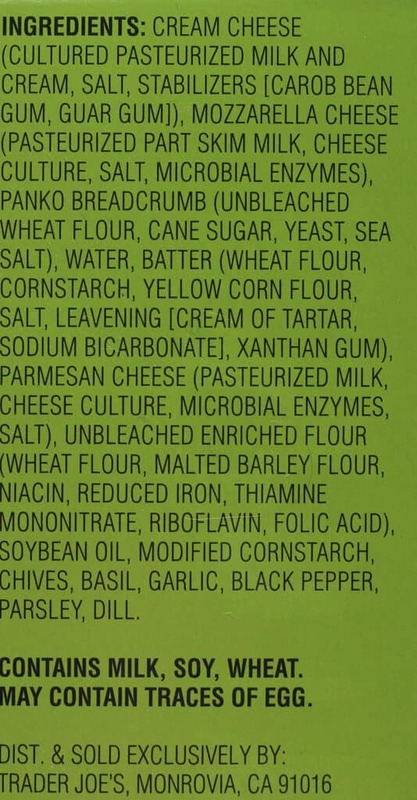 The panko adds a nice crunch and contrast to the soft interior. Mine didn’t quite reach the color level of the box. But make no mistake, the dozen were gone relatively quickly with no leftovers. For $2.99 for a dozen bites, they were a pretty good deal. My husband and I both enjoyed these. Would I buy these again? Maybe if I see them. These are a seasonal appetizer, so I’m not sure how many times I’ll see them before they disappear off of my store’s shelves. 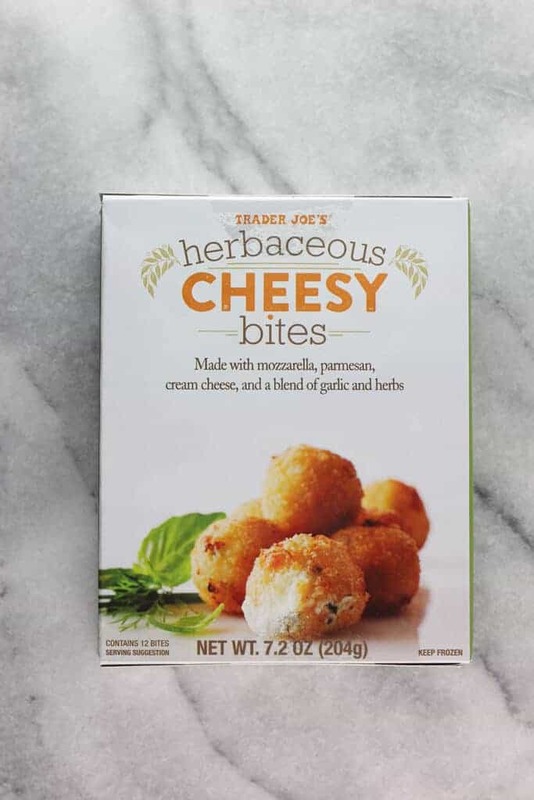 Trader Joe’s Herbaceous Cheesy Bites are made with cream cheese, mozzarella, parmesan, garlic and herbs in a panko crust. These were better closer to warm. The two minutes might not be enough time to cool these properly. Ya know…… I wasn’t crazy about these. And I do so love cheese. They were just sort of bland in my opinion. 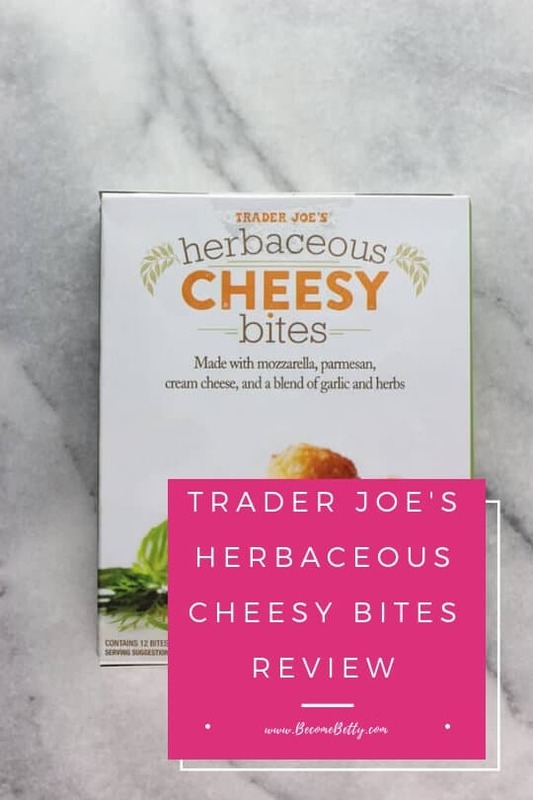 They could have used a stronger cheese or more herbs, more something. Don’t get me wrong they weren’t bad just not special. 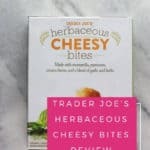 Maybe if they incorporated a stronger cheese like some gruyere or goat cheese along with more herbs I think they could have been better. Hey Dag! Fair enough. I wasn’t wowed by them, I hope the appetizers get better, I haven’t been impressed by the new appetizers hitting shelves. Thanks so much for stopping by! 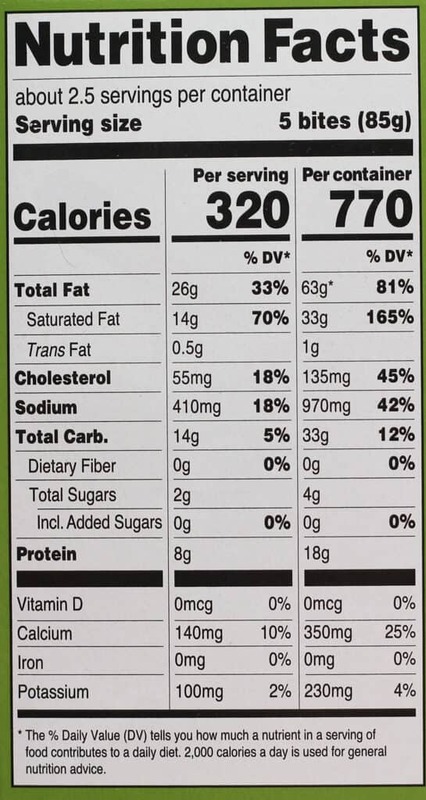 Would be lovely if it got jalapenos in there. A twist on jalapeno popper. Hey Alek! I think that would have added a lot more flavor than what was found in these. Great suggestion. Thanks so much for stopping by! I so agree jalapenos would have really added a new dimension to them. As is they are just nothing to write home about. Yum! 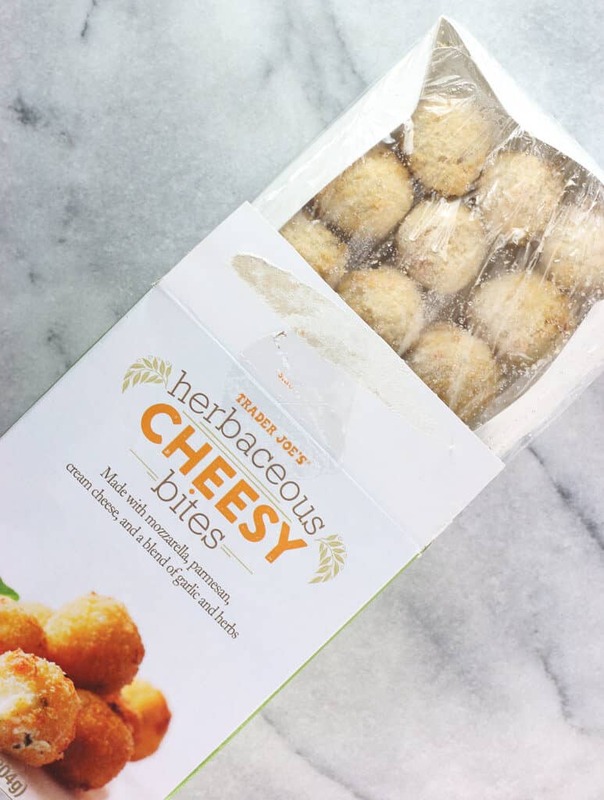 After seeing these I was hoping they would be a grown up version of mozzarella sticks, but still sound delicious! If you get a chance to try it, I’d love to hear what you think. Thanks so much for stopping by!